School officers questioned Ahmed about the device and why Ahmed had brought it to school. Boyd said Ahmed was then handcuffed “for his safety and for the safety of the officers” and taken to a juvenile detention center. He was later released to his parents, Boyd said. Asked if the teen’s religious beliefs factored into his arrest, Boyd said the reaction “would have been the same” under any circumstances. Obama has invited the kid to the White House and he has become Exhibit A against American “Islamophobia”. One problem with all this: it is possible that the entire incident was staged by the boy and his father. And according to the cops, Ahmed was significantly more cooperative with friendly media than with the police who came to ask some simple questions. Elhassan, a native of the Sudan who is now an American citizen, likes to call himself a sheik. He wears a cleric’s flowing white robes and claims hundreds of followers throughout Egypt, Sudan and in the United States. But he is unknown as a scholar or holy man in the state he has called home for two decades. Religious leaders in Texas say they have never heard of Elhassan, including the imam at the mosque where he worships. It’s no surprise that Ahmed Mohammed’s dad ran to the cameras at the first opportunity. It’s also no surprise that the terror-connected Council on American-Islamic Relations arrived to push the Islamophobia narrative immediately. Go here to Breitbart to read the rest. Fake invention, fake Islamophobia, real publicity stunt? You make the call. Good! The the kid can meet a fake President. In our happy “it takes a village,” how many children and adults have been senselessly murdered by children in school’s, university’s or movie theater’s? This village of ours is under siege, and by God, to rule on the side of caution is not a crime nor a exercise in racial profiling. Interesting back story on dad! To me, the box looks suspicious. I didn’t pay much attention to the story, but did find it odd that all the people who were anti-gun-shaped-pop-tarts, were pro-bomb-looking-clocks. The left is schizophrenic. Gizmos with wires….pressure cookers? What a world. I recall regularly walking to high school with my .22 cal. (rifle club) and also walking in the dark across the inner-city (to catch the 4 AM bus into the country), with my Mossberg.20 ga. shotgun to get an early hunt in. Neither act caused even a minor glance from either; police, teachers, or nice little old lady passengers asking me what I hoped to catch. We old geezers think back to a saner time with far more on our minds than mere nostalgia. What is this kid’s’s crackpot father doing in the US anyway? Oh, right. Democrats let these people in, and then Republicans do nothing to get them out. Yup, it seems that our government has become like those old phony tag team wrestling matches with pre-designed outcomes, while we rubes scream and yell in compliance. I knew there was more to this story than what the mass media was telling us. Even before I read this post, I felt the school was justified in it’s actions. The mass murders that have occurred at American schools over the last few years and the violence that Muslims are capable of committing, was reason enough for the school to take the actions that it did. BTW, I think both the boy and his father ought to be shipped back to Sudan. They’re nothing but troublemakers. WWF can’t touch the bs that Madame Secretary cover’s herself in. Laughing off the CNN reporter recently, regarding e-mailgate. Check the comments at Art Voice– one of them says that the kid showed it to his science teacher first, who checked it out and told him that he shouldn’t be taking it out. Which he then did, until he GOT a reaction. Yeah, he wanted a reaction. Only question is if he was put up to it, or if he was being a twerp as a 14 year old boy sometimes will be. Let’s assume, for argument that the kid was 100% innocent. Taking apart a digital clock and sticking it, inelegantly, in a new box is the kind of thing a nine year old does. At the very least, it’s an example of someone expecting high praise for managing to work a screwdriver without electrocuting himself. If he’d used it to make one of those Raspberry Pi computers AND styled it to look like a bomb, it’d at least be kind of cool. 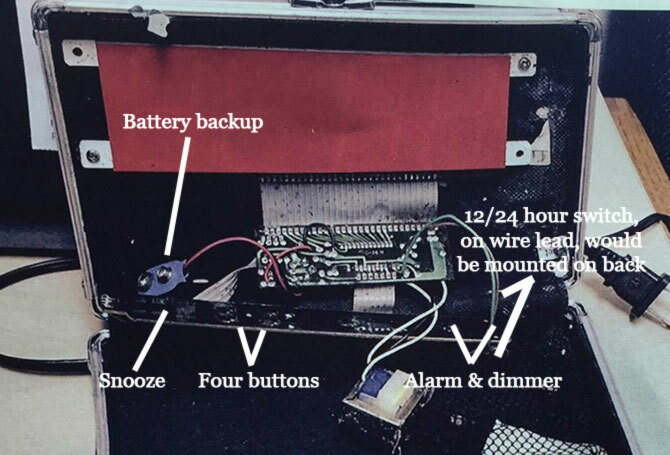 But… taking apart a clock? That’s it? And I thought building inaccurate forts out of sugar cubes at 14 for history class was lame.